If you've patched 0.1.2 and want to apply the patch directly, you can use this. Note: There is only a patch from 0.1.2 to 0.1.3. You cannot patch earlier versions to 0.1.2. Fire Emblem IV: Inheritors of the Crusade is a GBA Hack of Fire Emblem 7 (US) remaking the classic game Fire Emblem 4: Genealogy of the Holy War. It aims to be a new take on an old classic, changing features from the original as necessary, yet trying to stay faithful to the source material. Version 0.1 contains 10 chapters of content (of varying quality), with lots of features to help (or challenge???) budding tacticians. The patch can be applied using NUPS or Tsukiyomi. If you use a Mac, you can also try Multipatch. Apply the patch to a clean ROM of Fire Emblem 7 US edition. Apparently, no$gba has a unique bug with this ROM. (scroll down this page for more details.) If you choose to use no$gba, please be aware of this. Version 0.1.3 bugfix and content update. This fixes several minor bugs and tweaks the balance of Eve, Lachesis, Jamka and Edain. It also adds a new skill, Biorhythm, for Eve. Version 0.1.2 bugfix. This fixes two major bugs: Arden breaking the arena, and the Knight Sword not being properly locked to Sigurd. It also does some minor text bugfixes. Version 0.1 April 2016 release. Note that this patch contains a serious bug with Ointments. Use the 0.1.1 release instead. Version 0.a April 2014 release. This is a fully playable single chapter joke release. A skill system with 20 different skills to try out! Over a dozen new items with unique effects! Familiar music from Fire Emblem 4, adapted for the GBA, and music from other sources! HP bar display on the minimap, as well as additional flashing tips! 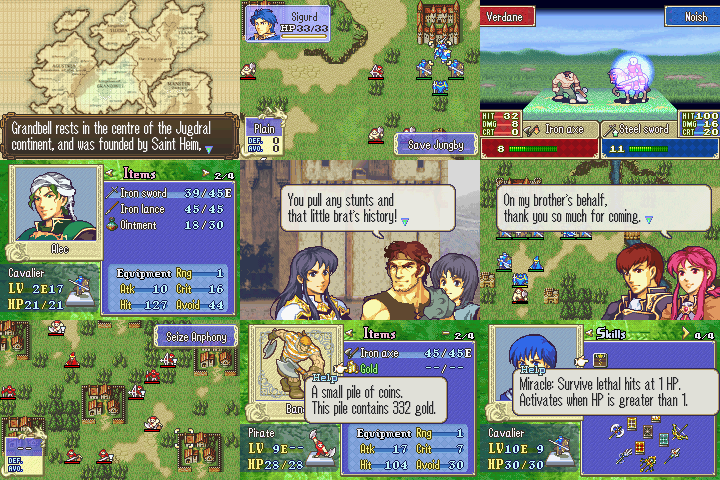 Fire Emblem 4 Resources, including a reference translation and world map. There are a few cosmetic bugs still present in this release. I aim to fix them in a bugfix 0.1.1 release at some point. Feel free to point them out to remind me of them if you wish. If you find any gamebreaking bugs, do post about it as soon as possible so I can issue a bigfix patch. Q: Arden/Eve/Other unit doesn't have animations for some weapons. What's going on? A: I haven't made new animations for their new weapons yet, so I've just made it default to the map animation for now. When the animations are made, I'll insert them in a future update patch! Q: Why are the stats in the r-button menu different colours? A: The colours give a rough indicator of the unit's growth rates in that stat. There are 4 possible colours: Dark Grey means the growth is between 0-20%, Light Grey means the growth is between 21-35%, White means the growth is between 36-50% and Green means the growth is over 50%. Note that the HP stat does not have this indicator. Q: I let a unit die and they came back the next chapter. Does this hack have a Casual Mode? Q: Why is Noish/Lex/Azel/Jamka/Holyn a zombie? A: This hack has a feature that's similar to Casual Mode with minor differences. Although units will come back after dying, they will have generic growths instead of their usual growths (and in future versions they won't be eligible for inheritance.) The zombie portraits are leftovers from the Halloween update video I made, which can be found on the Youtube channel. You can find a link to the channel below. Note that not all units will return after dying. The units that stay dead are Diadora, Cuan, Ethlin, Fin, Eve, Sylvia and Fury. Q: How does the Golden Axe work? A: Its might increases by 1 for every 500 gold you have, capping at 4000 gold (so up to +8 might.) This change is only reflected in the battle previews. Q: What's the critical bonus from Daredevil? A: Daredevil will give +1 crit to the user for every 4 hit from the enemy, so for example 56 Hit will give +14 crit. This bonus caps at 100 hit, which is the maximum displayed hit. Enemies that can't attack have 0 hit. Q: When do you get the extra attacks from Astra? A: Astra gives an extra attack when you have 6, 8 and 10 more AS than the enemy for a total of 5 attacks when you include the extra attack from doubling at 4 AS. ....what sort of sorceror are you!? Well, I'm not getting any work done in the near future. Location: The land of beer, cheese, the Packers, and beer. And within a few turns my Noish dies to a 22%. I shouldn't have expected anything less. Welp, will still be playing a lot of this! Canto for Midale on that village in Ch1-1 displays the pathfinding for the entire map. She can only move her normal movement, but moving the cursor beyond the customary 11 tiles crashes the game. 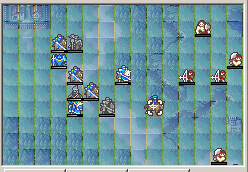 Edit: It's somehow broken the pathfinding display for all of my units now, and it's saved to the save file. Was fixed by restarting the chapter. Save with bug active - no$gba format. Edit 2: Seems it can be triggered from the other village as well. Doesn't require Canto, just visiting one of the villages will trigger it. I really liked the Girl in the Spirit Forest rendition.. I found a bug: Alec's Sword disappeared after the Ointment was consumed. When you say consumed, do you mean any time it's used, or when it ran out of uses? Edit: I've reproduced the bug on my end. This is pretty gamebreaking so I'll push a bugfix patch out soon. Confirmed that this bug is no$gba specific. So uh, don't use it and use VBA or whatever instead. Oh yes, more good stuff to play. This will bridge the time till the release of FE14. *claps slowly* Well done... My jaw is still on the floor. So I'm not the only one! For me, Noish died 3 times from no more than 50%. For some reason, he's RNG cursed. Two bugfix patches coming in piping hot! The first post will be updated with the latest patch as well. Note that you should restart if you had the ointment glitch occur to you, this patch will not restore your lost items. Edit: Hot tips for Noish and dodging in general: Do not expect anything above 40% hit rate to be safe. Noish is not the dodge build cavalier (Hint: it's the one whose skill gives him avoid) and is actually fairly fragile. Got a message "Patch is corrupt". The older version could be patched though. Edit: Fixing the patch worked. I re-downloaded the patch myself and applied to an unpatched ROM, and it works fine. If more people report issues I'll reupload it. The update patch worked fine for me using the 0.1 patch from the initial post. The tactician input says "you are a tactician travelling across elibe". Pedantry is appreciated. None of the tactician stuff has been added other than support for the name. I'll keep that in mind when I get around to it! Question: in 1.2, I see a lot of ppl with supports, but I can't access them. Do I just wait a while b4 trying or is this a bug? It sorta irks me that you don't use the updated names. Otherwise, I would totally patch it.